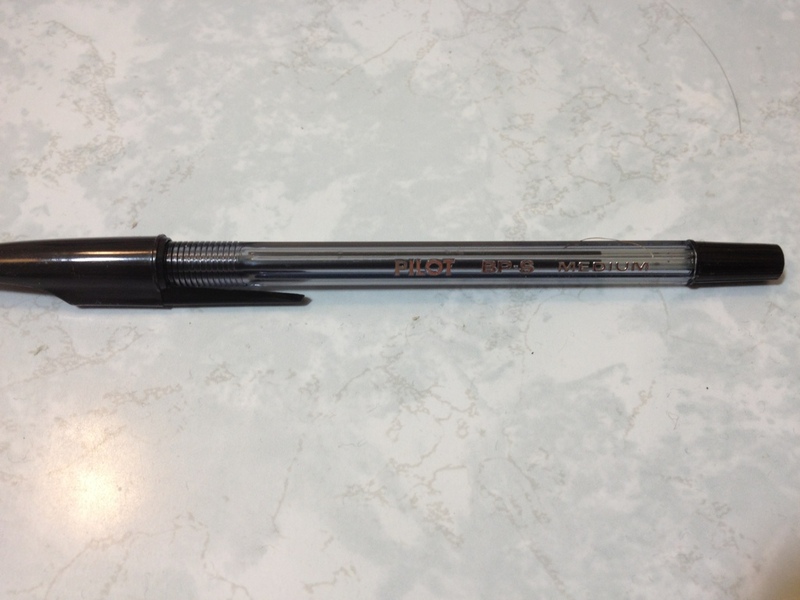 In the past, I have looked upon the Pilot G-2 more favorably than some other online reviewers, but I’ve still never used one for any time beyond the review period, and it isn’t exactly a pen I would be recommending to anyone. The best things about it are that it’s cheap and well-built. So, of course, someone came up with the idea of combining those features with a better-writing tip. With a few simple modifications you can get the G-2 to accept Mont Blanc ballpoint refills, but is it worth the hassle? The actually “modding” process is pretty simple once you have the components. Remove the ink cartridge from the G-2 (obviously leaving the spring inside). Then open up your Mont Blanc pen refill of choice. These refills come with a plastic sheath to prevent accidental markings (and probably some damage); cut a thin, short tube out of this material and to slide around the refill like a collar. Then cut a longer tube out of the rest to fill in the space between the click mechanism and the refill (more detailed instructions can be found with a quick internet search). These two bits should ensure that the refill is long enough to work with the mechanism, and keep it straight enough to operate. 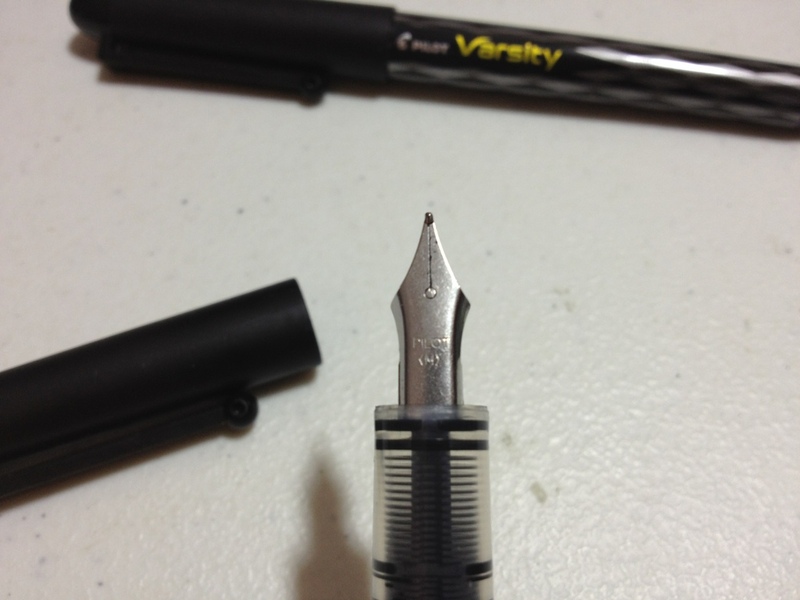 In terms of usability, I like the Mont Blanc refill, but not as much as many others do. Comparing it to the G-2 is a little apples-to-oranges, since my refill is a ballpoint one, and the G-2 is a (gel) rollerball. While the G-2 with its liquid ink and precise point, could feel slippery, scratchy, and blobby, this refill is super-smooth and easy-to-handle. It is buttery, and much smoother than your average ballpoint, but that’s also its biggest problem. Sometimes it feels like the tip is holding you back, or you’re writing in oil. Other problems, like startup issues and some blobbing that are common to all ballpoints are present, but more minimal than you’ll find in pretty much any other pen. It’s a very good writing experience. If you want the nice feeling of a good Mont Blanc refill for a cheap price, this is about as low as you can go. The actually assembly can be a bit fiddly (there are a few places where the new pieces of plastic can scrape and lead to a sticky feeling mechanism) but at less than $30, even if you need to buy a cutting mat and hobby knife, it’s miles below the nearest Mont Blanc (and I don’t know any other pens that use the refills), with the G-2 still being a super sturdy and comfortable body for the refill to live in. If you don’t believe that Mont Blanc has the best refills ever (like me) or you’re comfortable with your Cross and Parker refill pens (also like me) then you needn’t go anywhere near this trick, but if someone hands you one to try out, I’d at least try it out. I’ve taken a look at the Pilot Precise V5 pens before, and they’re pretty good pens in the standard compliment of black, red, and blue colors. But they also have a few other colors available, and in this little review I’ll take a look at the purple and green offerings. First the purple, which is much darker and a much truer purple than most, which are more a fuchsia. The color is deep, but not deep enough to be washed out. It could still conceivably be used in an office setting, but might be pushing it. And while there are rarely truer purples, it doesn’t have a very natural look to it. Perhaps it exists in some deeps shades of flowers, but otherwise it is far too dark. Startup with this color is easy, and while it does fade with water, it is still readable. And second, the green, which again is much darker and much truer than other greens. It is unmistakably green, but darker than what one would usually think of green as being. It doesn’t get close to a forest or hunter, but certainly is far from a light or lime. I couldn’t think of any office uses, unless you’re a teacher who doesn’t want to use red. It is just light enough to stand out and not look professional. In art, though, it is a wonderfully natural color, and it shades a little bit for interesting effects. It has a bit of a startup problem (or a drying out problem) and is the less water-resistant of the two, but it is still adequate. Is it worth moving over to Pilot Precise pens just to get these colors? Unlikely, but they are great colors that add to an already nice lineup. I enjoy them, and very similar colors are hard to find in disposable rollerballs or gel pens. They might be worth a look. There are some pens that everyone knows about, standby pens that we all recognize and know the performance of. These are pens that even pen snobs would use in a pinch. 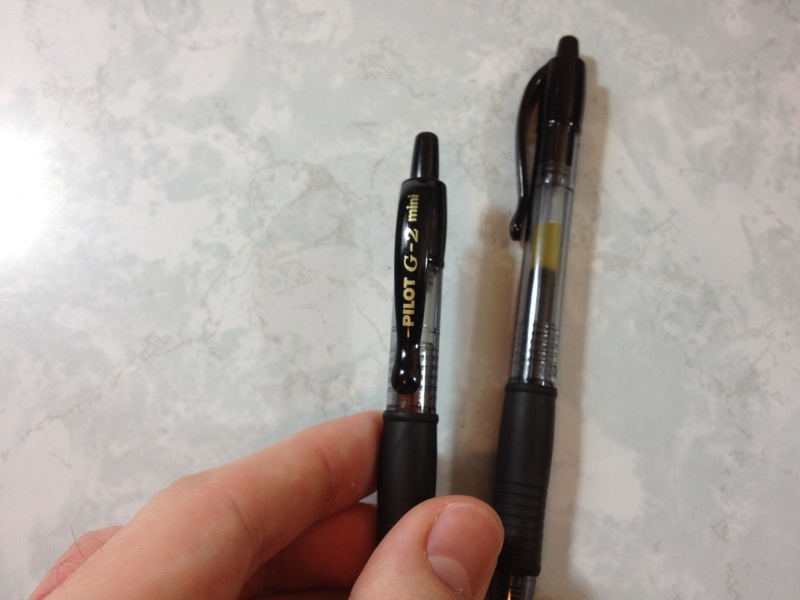 The Pilot G-2 and G-2 Mini perhaps are such pens. But do they really hold up to their reputation? Let’s take a look. I’m not sure I really need to describe one of the most well-known pens ever, but I’ll start at the click button. It is simple and elongated, and there is nothing really special about it. Below it is a small section of colored plastic where the clip attaches. The clip has the basic pen info on it, though not much. It does its job well. It might be a bit loose, though the absence of a catch on it makes replacing it in and retrieving it from a pocket much easier. Down from this is a smooth, transparent, circular barrel. There is nothing exciting here, but I should note that the only differences between the regular and the mini are the cartridge size and the length of this barrel here. 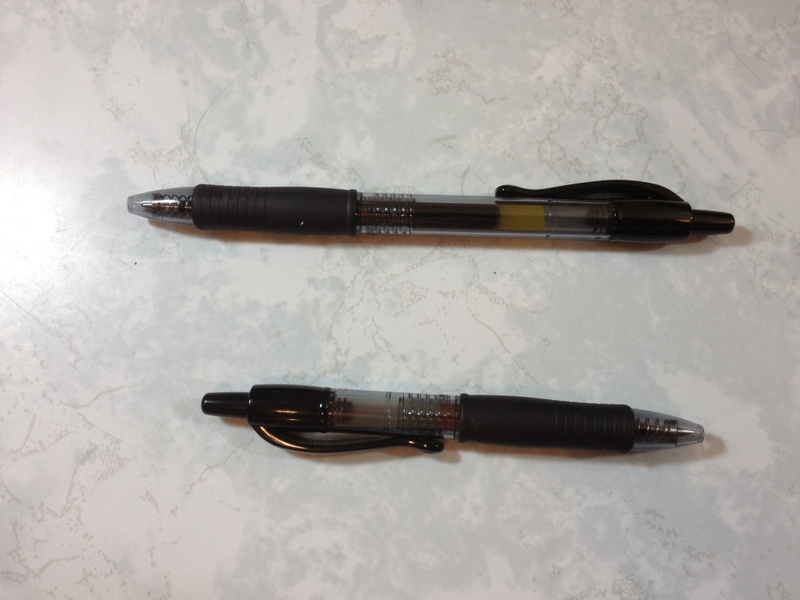 All other aspects of the pens are identical, which means the mini is a bit thick for its size. After the barrel comes a fairly distinctive grip with a small recessed and grooved area where ones fingers go. The grip style is good but the rubber is slick, so the net effect for me is that the grip is unnecessary. 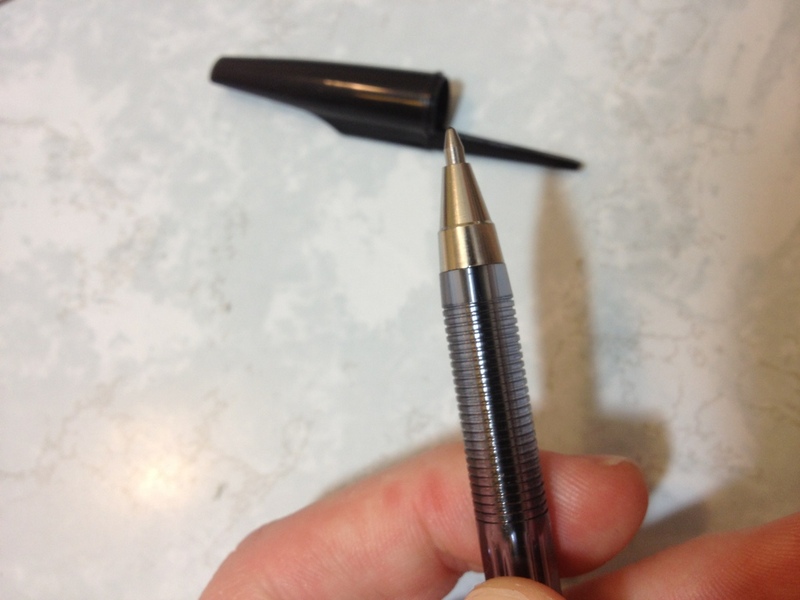 Below that there is a small plastic cone that leads to the retractable point on the pen. Now, I’ve talked about as many Pilot G-2 ink colors as I could get my hands on in the past, so I’m not going to cover that here, but I will go over the overall writing experience. The pens are gel pens and are quite a bit smoother that standard ball points, though the smoothest of ballpoints will almost rival the cheaper gel pens like the G-2. The G-2 has quite a bit of feedback, which is something I do like when writing. Sometimes, though, it doesn’t feel like you’re putting down any ink and instead just scratching the paper. There are generally no blobs unless you’re looking at the more outlandish colors, but on cheaper paper the ink absorbs very fast and will quickly create dots anywhere you decided to stop. Really, there are very few problems if one just sticks to standard black. All other colors do tend to have unique effects to them. Long drying time is a problem with all of them, I’m afraid. Overall I’d say the pen is still quite a good regular pen. Despite the many little flaws that it may have, it works, and it does the job of being a pen well. It isn’t the best pen, but it’s not very expensive and it’s far from the worst. It’s a pen everyone can use, but if you’re not a satisfied pen user and you’re looking for the best for you personally, you might want to try somewhere else. If you’re looking for a fountain pen but don’t want to purchase something expensive or something you have to fiddle with, then a disposable fountain pen might be the way for you to go. 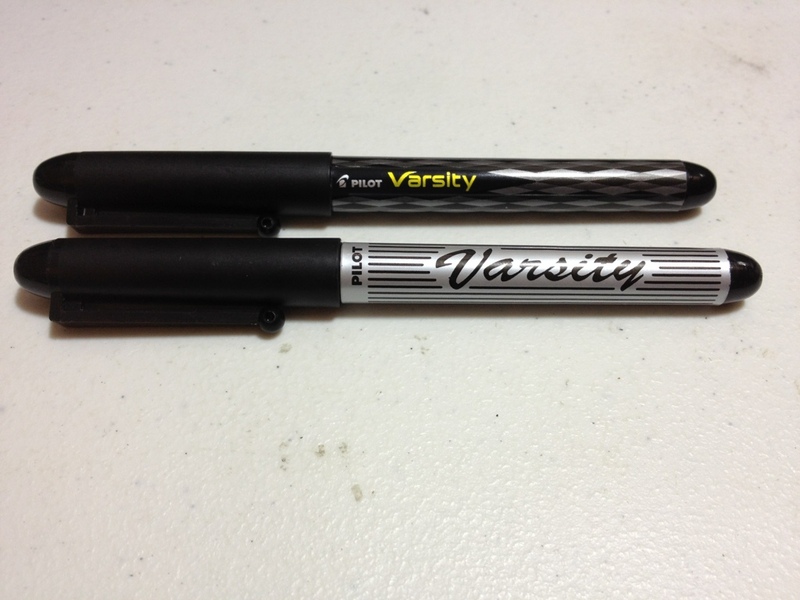 And If you’ve tried before with the most common disposable fountain pen, the Pilot Varsity, and are looking to get another one, you may have seen the slight changes they’ve made to the design. Are these changes that big a deal? Well, let’s find out. The nib at the end of the pen is again simple. It is stamped “Pilot <M>” (medium) and has no further ornamentation, not even a breather hole. It is stainless steel, and offers no flexibility in the tines. Now, one might think that since they’re both stamped medium, that both pens would have roughly the same line width; and this would strangely be wrong. At least on the example I have, the older Varsity has a line more akin to a fat medium, or a particularly skinny broad, while the newer example is more of a fat fine, or a sorta skinny medium. If this is indeed a purposeful change that was made, I’m guessing it was for the American market to prevent bleed-through on the extra-crappy paper here, which it does do. 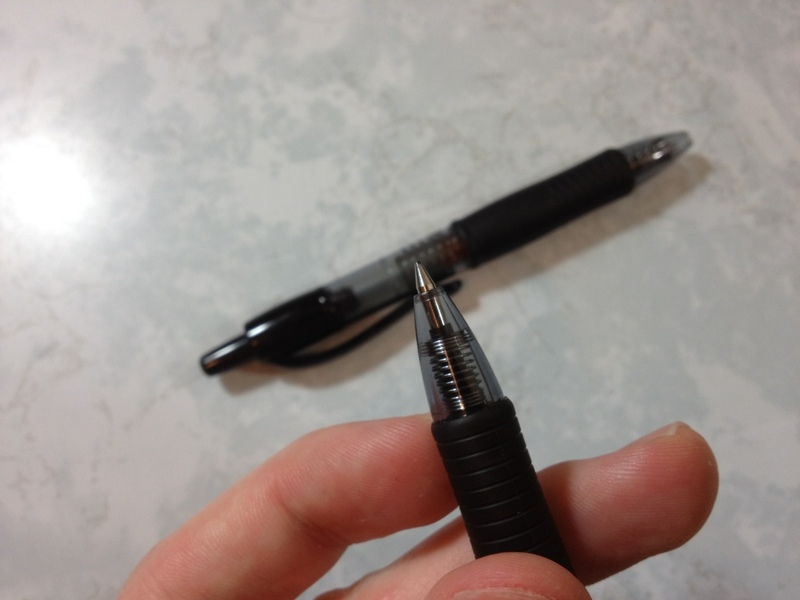 This size difference definitely doesn’t affect the nib performance, though. Both nibs are buttery smooth, have no startup issues, and write under no pressure. The ink is the standard Pilot black, and there is nothing different between the two pens that I can discern (and neither are at all waterproof). So, which one should you get? Well, it really doesn’t matter. If you really want a fat medium nib disposable (well, kinda, you can look up how to refill it online) you can hunt down some of the old ones, which I personally like better due to purely aesthetic reasons. The new one is a bit more loud and silly, and a bit finer in line, but you’d be really hard-pressed to tell that unless you were looking like I was.